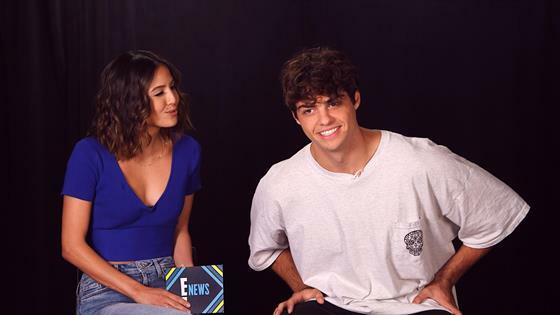 The To All The Boys I've Loved Before star sat down with E! News' Erin Lim to dish on all the characteristics he looks for in a potential girlfriend. To start, he said it is a major turn off when a girl "doesn't take care of themselves, like across the board, whether it is mentally, emotionally, hygiene or like just feeling good." The currently single star also couldn't see himself with someone who "shuts down and is passive aggressive as opposed to someone who could communicate how they feel." Albeit, he totally understands that it's "really hard to do that," however, he says he has no problem "being like, 'alright I f--cked up, I know what I did was wrong.'" "Someone who takes care of themselves and someone honest. Those are really the two big things for me," he shared. As for his type, the 22-year-old doesn't really have one. In his words, "It's just a vibe thing." And that means you likely won't be seeing him on any dating apps. "I'd much rather meet someone randomly, like whether that's me out doing something that I love to do, because if you're out doing something that you love to do and you meet someone doing something they love to do then you're doing things you love to do at the same place, then odds are you like the same things and you have similar interests to talk about," the Florida native said. Basically, he likes to meet people in person. He also talked about the onscreen chemistry he and Lana Condor share in the romantic comedy. While that chemistry is very much real, Lana is simply his "home girl." Noah said, "She's in a relationship and super happy, he's an amazing guy and she's like so over the moon about it." Besides her having a boyfriend, he feels that they look at each other more as "brother and sister" and it's better they stay friends for the sake of their work. Lana's explanation to Elle, on the other hand, was: "Uhh, well, I'm not going to answer that!" While they did look pretty cozy in that behind-the-scenes photo of them cuddling, Lana explained, "Well, we were just very, very tired. He looked very comfy on the couch and I said, 'I want to sleep as well. I want to take a nap. I'm taking a nap and we're going to nap together!'" She concluded, "Noah and I just have great chemistry. We've always been very connected. That was very normal." You can see Noah when he stars in Sierra Burgess is a Loser, premiering Sept. 7 on Netflix.